Arlene Kaye has battled multiple sclerosis for 38 years. Arlene Kaye jabs the button to open the garage door at her suburban Orange County home. Sunlight floods the space, revealing that Kaye has places to go and people to see. Although she has battled multiple sclerosis for 38 years, Kaye, 62, will not be deterred. Her car is equipped with hand controls so she can drive despite a weakened right leg. The trunk holds a scooter in case one of her three walkers will not do the job. A stack of “The K Team” placards is stored along one side of the garage. Each year Kaye organizes supporters and she participates in the annual MS Walk in Orange County, which raises awareness and funds to fight the perplexing autoimmune disease. Multiple sclerosis is a chronic, progressive degenerative disorder of the central nervous system that, until recently, was shrouded in mystery. The disorder, which is increasingly more common in women, is characterized by an immune system that attacks the entire central nervous system—brain optic nerve and spinal cord—and disrupts communication between the brain and the rest of the body. Many patients have periods of symptoms followed by remission. MS is caused by a combination of genetic and environmental factors, Courtney says. While there is no cure, MS patients today fare much better than even 10 years ago due to a better understanding of the disease and a trove of new medications. Kaye has seen this evolution firsthand. She developed optic neuritis, an inflammation of the nerves in the eye, at age 23. She had 15 bouts of optic neuritis in 10 years. Although MS was suspected, she wasn’t formally diagnosed until 2005. “I had 25 to 30 years to think I had MS,” she says. Medications aim to recalibrate the immune system to slow or stabilize the disease process. Drugs now in clinical trials may even help repair centra nervous system damage, “which will be a miraculous advance,” Courtney says. Patients in the UCI Health MS Program, which is designated as a National MS Society Comprehensive Care Center, have access to the latest diagnostics, medications and clinical trials. There are only a few National MS Society-designated centers in the United States. UCI Health researchers are studying the use of stem cells to restore function, and Dr. Michael Demetriou, co-director of the MS Program, is exploring whether a glucosamine-like sugar supplement can help regulate overactive immune cells that target the brain in MS patients. However, medication is only a small part of the disease management. Courtney emphasizes physical fitness, diet, education and psychosocial support. In addition, a dedicated MS nurse navigator, Erin Fromm, RN, MSCN, helps UCI Health patients connect to local resources, including a wealth of MS Society programs. But it’s a two-way street, she says. 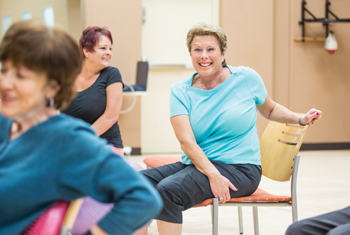 Patients like Kaye thrive because they embrace all of the strategies to fight the disease. Kaye, who takes medications for the disease, works out four times a week at the Goodwill Fitness Center in Santa Ana—one of the few gyms in the region equipped to help people with disabilities. She attends an MS support group and serves on the National MS Society committee for programs. The decline in mobility has not diminished her zeal for life. Nicknamed the “Energizer Bunny” by her friends, Kaye and husband Robert travel extensively. She also organizes “The K Team” to raise funds and walk in the Orange County MS Walk each year. She has raised more than $35,000 over nine years. Learn more about multiple sclerosis treatment and research at ucirvinehealth.org/ms.